The ‘Belgian CEO of the Year’ awards organised by Trends/Tendances business magazine are a ‘big deal’ in the market. Candidates are selected for their merit in managing a striking turn-around, an intensive expansion, a remarkable innovation, an excellent balance sheet, a strategic revamp, success on the stock markets, or a combination of these factors. So, we’re excited to see Emakina Group co-CEOs Brice Le Blévennec and Karim Chouikri nominated as a team. If you want to give them your support, you can vote for the Emakina tandem! In a sector experiencing significant concentration, digital agency Emakina continues to act as a conqueror, multiplying acquisitions and continuing its growth in Europe. 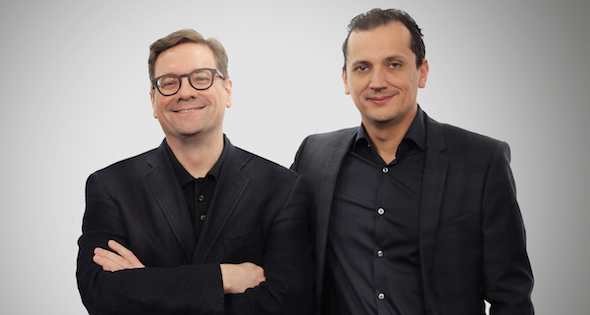 Today, the independent sector leader employs nearly 800 people, while co-CEOs Brice Le Blévennec and Karim Chouikri envision themselves in Asia and the United States. We can’t these two guys are alike. When it comes to interviews with the press, each has his own method. Brice Le Blévennec is very extroverted, gets carried away in his answers, multiplies examples “that will go well in your article”, and speaks with passion. Karim Chouikri, sitting next to him, gently slides in a “I’ll take over in 2 seconds”, and then aligns with a succinct, thoughtful but emphatic analysis. In fact, the men who have been running Emakina since January 2014 as “co-CEOs” complete each other perfectly. Brice Le Blévennec, who, in 2001, co-founded the leading agency in Belgium, plays the role of the visionary, who identifies important technologies and those that are only a flash in the pan, defines the axes of development not to be missed and the sectors to target. Discreet and most of the time in the shadows, Karim Chouikri takes responsibility for operations, finances and acquisitions. He became a shareholder of Emakina in 2003, but got really involved with day-to-day affairs while piloting the IPO on Alternext, before taking charge of the acquisition policy. And we can say that the tandem brilliantly navigates in a fast-evolving sector The two men can now boast of managing an “independent European leader” in the world of digital agencies from Watermael-Boitsfort, in an industry that has focused heavily on global advertising giants like Publicis, WPP etc. At the end of 2016, the Emakina Group employed no less than 785 people in nine countries, about 400 of which in Belgium. Emakina combines growth with acquisitions: since 2007, the group has already integrated more than fifteen companies in Belgium, France, the Netherlands, Austria, Switzerland, and Sweden. It still has two ‘big pieces’ to add to the board (Germany and the UK) to really ensure a presence throughout Europe. But that does not prevent the duo from seeing beyond this. Through its agency The Reference, it opened an office in New York and launched its first bridges to Asia. Regarding business, Emakina also has the ambition to be an unavoidable force. The creation of websites (‘the heart of data and business strategy’) continues to account for most of its activities, but the group also offers services à la carte in applications, e-commerce and all aspects of digital marketing. Among its customers, Emakina can list the majority of the largest Belgian companies (National Lottery, Brussels Airlines, Colruyt, etc. ), but also (and this is what the group is looking for) international customers such as Unilever, Hema, Bombardier, Nike, Red Bull, etc.